Former Texas Gov. Rick Perry is calling for an end to the Export-Import Bank—a reversal from the position he held as governor. In an op-ed for The Wall Street Journal published Monday, Perry, a likely 2016 Republican presidential candidate, wrote that he has changed his mind. But now, in light of “recent revelations of corruption and bribery at the institution,” Perry said he can no longer support it. 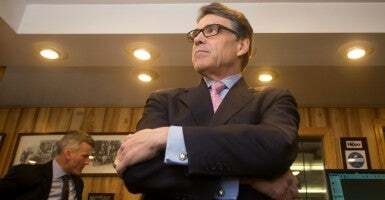 “Next month, the bank comes up for reauthorization again—but this time I can’t get on board,” wrote Perry. The Export-Import Bank is a little-known government agency that provides taxpayer-backed loans and loan guarantees to foreign countries and companies for the purchase of U.S. products. Ex-Im’s backers argue the bank helps small businesses compete in the global market. The bank’s charter expires June 30, and as Congress inches closer to its deadline on whether Ex-Im should be reauthorized, the debate over its future is heating up. A number of other presumed and declared Republican presidential candidates—including former Florida Gov. Jeb Bush, Sens. Marco Rubio of Florida, Ted Cruz of Texas and Rand Paul of Kentucky, and Wisconsin Gov. Scott Walker—have also called for the bank to be shuttered. South Carolina Sen. Lindsey Graham appears to be its lone supporter in the present GOP field.